I was going mad after thinking what to post for this Summer Express Cooking Event :O then I saw a message left on my previous post from some anonymous giving me the idea to repost the Hearty Salad, Spaghetti with roasted peppers medley and Strawberry cups for this event by Mallugirl. I was little busy with lot of things going on past few weeks so hope my previously posted recipe will be accepted. This is a super easy, fast and express meal for any time. As I did lot of talking in the previous post, I am keeping mum here so that I can finish on time and post this recipe for the event. Prepare the dressing by first adding dijon mustard in the lime/lemon juice whisk well. Add freshly ground black pepper, salt, sugar, honey mix well. Whisk vigorously while adding extra-virgin olive oil. 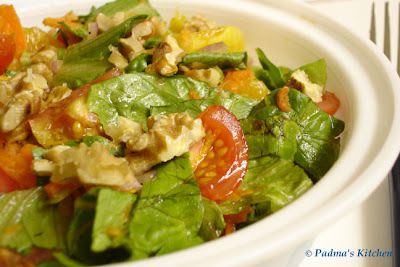 Spread over the salad, mix and cover it with plastic wrap and keep refrigerated. When ready to eat top it with chopped toasted walnuts. This express meal is done within 15-20 mins if you have all the ingredients handy. Cut the peppers lengthwise as shown in the above picture, coat them with 1 tbsp of extra-virgin olive oil, sprinkle some salt and ground pepper. 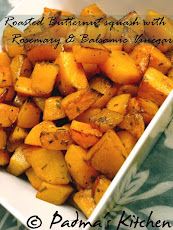 Toss and roast it on a tava or in oven till the edges are browned. Meanwhile cook the spaghetti as per the instructions on the box, check al-dente, drain and keep aside. While the peppers are roasting heat butter and 1 tbsp of extra-virgin olive oil in a large sauce pan, saute garlic and shallots. To this add the pasta sauce, chilly (cayenne) powder, salt. mix and add the roasted peppers, stir well for a minute or two. 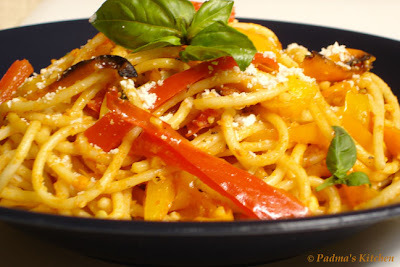 Toss in spaghetti and add lime/lemon juice, roasted peanuts, torn basil leaves and let all the flavors combine. Sprinkle some grated cheese and serve hot. Top it with whipped cream as per your requirement. I love little extra topping for mine. 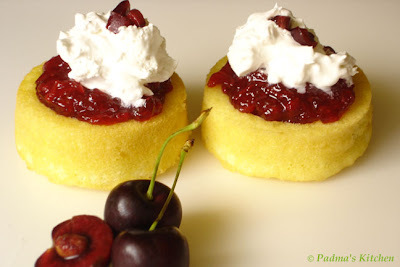 Garnish with chopped cherries or any of your favorite fruit. Hope you all will enjoy as mush as I did while making this meal. Now who cleans the dishes? This is my entry for express cooking event. I was breaking my head that I had seen this recipe elsewhere before. Scroll down, thats yr JFI entry. Nice job ;) I would love to make this express meal! Padma, your Italian meal complete with salad and dessert is amazing. The pics are very appetizing. Padma, the strawberry dessert is a great idea! 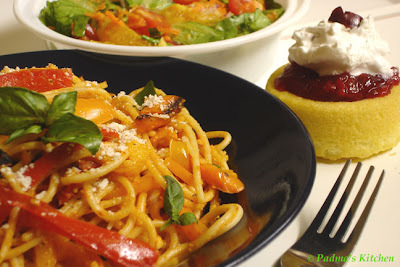 Don't know which is the best dish in the three ... as they all look yummy and so summery well done ; i love pasta dishes. I dont eat pasta whenever I go to italian restaurant because I find it to be bland. I will try your version as it has peppers. May be I will like it, as the pictures are so tempting that I would definetely love to give a try. Wow! nice meal. I like the dessert most!Great pictures. Great entry and this meal looks so tempting! Wonderful! I am having a tough time deciding whaich I like better! Love the dessert cups!! Too Good!! 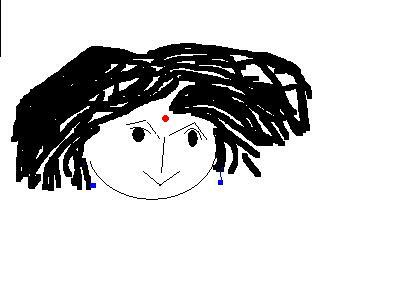 Hey Suganya, sorry abt that...yeah even i was scratching my head for the express cooking entry...LOL! Hey Cynthia, Thanks you so much for your heartfelt message, I am glad you liked it! Lia, thanks for stopping by, feels happy so see all your comments here. Hope you enjoyed it! i was thinking i commented for this post and where has my comments gone then i found it's for jfi.it sure is express meal.nice pics r beautiful. Dear Coffee and Ramya, thanks for your kind comments, I am glad you liked it and bookmarked it too! Its a great feeling when I can see you people are loving my recipes and willing to try then....Thank Q all once again! Looks beautiful, especially the strawberry cups. I love these kind of pasta dishes. Italian is my favorite!